Come warm weather days and my thoughts switch to powder-based foundations, especially of the mineralised kind. They are superb at soaking up excessive greasiness, while staying put for hours. Plus they don’t clog the the pores, making them perfect for those with acne-prone or sensitive complexions. 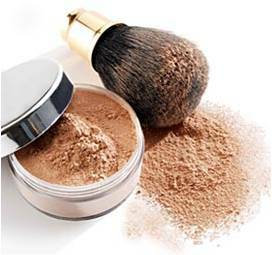 And if you apply them correctly, powder foundations can look absolutely seamless, creating the illusion of absolutely perfect skin. Hooked? This is how you should apply powder foundations… mineralised or not. 1. Take a large powder brush, hold it horizontally and sweep the sides of the bristles into the powder with swift back-and-forth strokes. 2. Then, instead of sweeping the brush across your face (like we do with translucent powder), press the bristles onto your skin with a slight rolling motion. Repeat across the face till you have the desired level of coverage. This totally smooths out uneven areas, like pimples and dark spots, while allowing you to gradually build up the coverage without it looking flaky or caked on. 3. Then start buffing the outside of the face with a really soft brush, slowly working your way in towards the forehead, nose and chin. The minerals will warm and blend with the oils in your skin to give that “no make-up” make-up look. 4. Set with a light dusting of translucent powder.